COMMENTARY: Actually, this didn’t happen very soon after, but in fact before the cleansing of the Temple, not only according to 1 Maccabees but by all other historical references. But putting the cleansing of the temple first underlined God’s hand in protecting His people by making apparent their return to Him. COMMENTARY: Everybody thinks that their own culture is the best. Some are content to bask in self-satisfaction, but others talk themselves into believing that they’re doing others a favor by imposing their own ways on them—especially if the conquerors can profit from it. 3) to levy tribute on the temple, as he did on the shrines of the other nations; and to put the high priesthood up for sale every year. COMMENTARY: Officially the King was supposed to ratify a high priest impartially, but in practical terms it went to whoever could promise the biggest bribe. 4) He did not take God’s power into account at all, but felt exultant confidence in his myriads of foot soldiers, his thousands of cavalry, and his eighty elephants. COMMENTARY: The ban on elephants expired with the last king. And what lesson can we take from this? When do we fail to take God’s power into account and instead rely on whatever’s tangible and obvious? And how easily we despair when the tangible and obvious seems insufficient to see us through a crisis! But we must never forget that God is there, beyond our comprehension, and He is full of surprises. 5) So he invaded Judea, and when he reached Beth-zur, a fortified place about five stadia from Jerusalem, launched a strong attack against it. COMMENTARY: A stadium was supposedly 200 yards long, and that would make this 10, 000 yards or about a mile and a half, but different parts of the Greek world measured by different feet. This could mean the “itinerary stadium” used to measure journeys: 172 yards or 157 meters per stadium, Olympic stadium (192 yd/176 m), Ptolemaic stadium (202 yd or 185 m), Babylonian-Persian (214 yd/196 m) or Phoenician-Egyptian (229 yd/209 m) none of which comes close. Beth-zur is about twenty miles away. However, you can see from all this that nobody took precise measurements all that seriously. It wasn’t just Bible writers. And yes, a stadium was supposed to be the length of a stadium, as in sports place. 6) When Maccabeus and his companions learned that Lysias was besieging the strongholds, they and all the people begged the Lord with lamentations and tears to send a good angel to save Israel. 7) Maccabeus himself was the first to take up arms, and he exhorted the others to join him in risking their lives to help their kindred. Then they resolutely set out together. COMMENTARY: Human beings, like bees, meerkats, yaks, wolves and other pack animals, have an instinct to protect the pack that can overpower the instinct for self-preservation. What made Jesus transcendent was embracing all of humanity as His pack. Judas Maccabee could, with a great exertion of charisma, summon up this instinct to inspire men on the battlefield to save their own people, but those of us who desire to emulate Jesus must offer a love greater than love of country, love of family, love of neighborhood, gang, fraternity or any other allegiance, and embrace the stranger, even our enemies. It is said that we love Jesus exactly as much as we love our worst enemy, and no further; that is hard to hear, but true. 8) Suddenly, while they were still near Jerusalem, a horseman appeared at their head, clothed in white garments and brandishing gold weapons. COMMENTARY: 1 Maccabees doesn’t have these angelic visions. It makes me wonder if some could see them and others not, even as some, at the baptism of Jesus could hear the voice of God declaring, “This is my Son, in whom I am well-pleased” while others only heard thunder. 1 Maccabees made a reference to the time of the prophets having passed, but I wonder if that only meant that, as a defeated people, they no longer had schools of prophecy for people of a natural visionary bent, no one to pass on the lineage. In truth, the Bible does not record the visions of many who studied in such schools, but does record the prophecies of men like Amos who never did, so I’m not sure how much good they were. I just wonder if the people were as abandoned as they thought. 9) Then all of them together thanked the merciful God, and their hearts were filled with such courage that they were ready to assault not only human beings but even the most savage beasts, or even walls of iron. COMMENTARY: Personally, and totally sidetracking, I’d rather deal with a savage beast than a savage human. At least, most of the time, they will leave human beings alone (having lived among javalinas, coyotes, rattlesnakes and bobcats, I can attest from personal experience that these don’t aggress needlessly, though you need to show them some respect.) But an anger-crazed human being, man, those critters scare me! 10) Now that the Lord had shown mercy toward them, they advanced in battle order with the aid of their heavenly ally. COMMENTARY: And even if most of them had not seen the angel, merely hearing about him would go far to inspire good morale. 11) Hurling themselves upon the enemy like lions, they laid low eleven thousand foot soldiers and sixteen hundred cavalry, and put all the rest to flight. 12) Most of those who survived were wounded and disarmed, while Lysias himself escaped only by shameful flight. COMMENTARY: Alexander the Great once quelled rebellion in the ranks by, among other things, displaying that all of his scars were on the front of his body, none upon his back. And by pointing out that not a man of them had ever suffered a back wound, either. This was a big deal in the ancient world. Unlike Hollywood and the glorious tales they were based on, actual pre-munitions battles (and early gunpowder battles) consisted of lines of soldiers trying to breach the other line’s safety in numbers. A man could keep his courage up with shields locked with his neighbors. But once an enemy breached that line, you suddenly had a gap in your defenses, so you’d have to clump with whomever you could to watch each other’s backs. If you lost them you had no recourse but to run. If you saw your fellows running, you’d join them because you sure as heck couldn’t take on the whole opposing army by yourself. But while running you’d keep an eye out for the standards of generals and captains, so that you’d have a rallying point to recoup, getting brothers in arms around you again. If those fell, you had no hope except in scrambling out of there any way you could, as fast as you could. The measure of a general was his ability to hold his men together no matter what, inspire men to leap into breaches and repair them before the damage got too far, or if it did, to rally the troops at a new point and give them a chance to fight their way out alive. If your general fled, that ended the battle right there. And back-scars were a permanent reproach to your commanding officer. 13) But Lysias was not a stupid man. He reflected on the defeat he had suffered, and came to realize that the Hebrews were invincible because the mighty God was their ally. He therefore sent a message 14) persuading them to settle everything on just terms, and promising to persuade the king also, and to induce him to become their friend. 15) Maccabeus, solicitous for the common good, agreed to all that Lysias proposed; and the king granted on behalf of the Jews all the written requests of Maccabeus to Lysias. COMMENTARY: That he came to realize he couldn’t defeat them was probable. The “because” was more likely the viewpoint of the Jews. 16) These are the terms of the letter which Lysias wrote to the Jews: “Lysias sends greetings to the Jewish people. 17) John and Absalom, your envoys, have presented your signed communication and asked about the matters contained in it. 18) Whatever had to be referred to the king I called to his attention, and the things that were acceptable he has granted. COMMENTARY: This would have taken a long time to arrange, with no fighting in the meantime. Both sides would know that this could give themselves—and the other side—time to build up a bigger and better-equipped army if negotiations failed. So it would have been a watchful peace. 19) If you maintain your loyalty to the government, I will endeavor to further your interests in the future. COMMENTARY: This makes me wonder if the message from Judas finally made it clear that the Jewish people had not originally rebelled as thought, but only rose up against unjust punishment for a rebellion that hadn’t yet happened. 20) On the details of these matters I have authorized my representatives, as well as your envoys, to confer with you. 21) Farewell.” The one hundred and forty-eighth year, the twenty-fourth of Dioscorinthius. 22) The king’s letter read thus: “King Antiochus sends greetings to his brother Lysias. COMMENTARY: Guardian, actually, but even a nine year old king knows better than to say that in public. 23) Now that our father has taken his place among the gods, we wish the subjects of our kingdom to be undisturbed in conducting their own affairs. COMMENTARY: Thus he shows formal respect to his father, right before undoing his policies. There is no particular evidence that Antiochus Sr. was ever elevated to the Greek pantheon, but it seemed proper that his own son at least should pretend to see it so. However, since his father’s death was by now old news, the main reason to mention this at all is to establish that he does not feel obligated to follow in his father’s footsteps, making the same mistakes. The King is dead—long live the King! 24) We have heard that the Jews do not agree with our father’s change to Greek customs but prefer their own way of life. They are petitioning us to let them retain their own customs. COMMENTARY: Talk about playing up the naif child role! As if he just now learned that Judea was getting a wee bit annoyed, and hey, he was only a prince, he has no idea till now that Daddy had lost a lot of soldiers and resources into the black hole of Judean outrage. 25) Since we desire that this people too should be undisturbed, our decision is that their temple be restored to them and that they live in keeping with the customs of their ancestors. COMMENTARY: Apparently Antiochus of the Good Father doesn’t agree with Daddy either, having just inherited a bankrupt treasury and a diminished military force (even if he did manage to add elephants, which as it turns out the Romans still considered banned, even if Greek custom allowed for the contract to expire.) This also shows that the author knows full well that he told events out of order and that the temple had not yet been restored. He’s probably quoting the letter verbatim here, which doesn’t quite fit the retconned version. COMMENTARY: And hopefully forget all about waging any further war. 27) The king’s letter to the people was as follows: “King Antiochus sends greetings to the Jewish senate and to the rest of the Jews. COMMENTARY: An interesting dodge, there. He’s not writing from king to king, but to a civilian ruling group: the senate, AKA Sanhedrin. 28) If you are well, it is what we desire. We too are in good health. COMMENTARY: So don’t get any ideas about this king keeling over in battle, should it come to it. 29) Menelaus has told us of your wish to return home and attend to your own affairs. COMMENTARY: Thus he makes the Jewish victory sound just a little bit like a surrender. Either he is one very clever nine-year-old or somebody wrote this letter for him. COMMENTARY: “This is a limited time offer...” Very limited, in fact. He sent this on the 15th of Xanthicus (roughly April) and I have no idea how long it took to get to Judea. The kid may be surrendering, but he’s doing it in as tough a manner as he can muster. Or is he? Historians seem to think that this date was a mistake, transferred onto this letter from a different one. 31) to observe their dietary and other laws, just as before, and none of the Jews shall be molested in any way for faults committed through ignorance. COMMENTARY: I’m not sure if he’s attributing Jewish customs to ignorance, or if he’s trying to pass off the whole rebellion as a misunderstanding. 32) I have also sent Menelaus to reassure you. COMMENTARY: Oh great! The assimilado High Priest who looted the temple and started the whole uprising in the first place! Or that’s what I thought at first. Turns out he’s not asking Menelaus to say reassuring things to his people. He’s turning him over to be executed, and hopes by this act to placate the Judeans. Historians say that he blamed Menelaus for starting the whole mess, which of course he did. 33) Farewell.” In the one hundred and forty-eighth year, the fifteenth of Xanthicus. COMMENTARY: Historians say that this date is wrong, since the peace treaty didn’t happen till a year later. They speculate that this letter got confused with the following Roman one. 34)The Romans also sent them a letter as follows: “Quintus Memmius and Titus Manius, legates of the Romans, send greetings to the Jewish people. COMMENTARY: This writer left out the politics involved in contacting the Romans in the first place. 35) What Lysias, kinsman of the king, has granted you, we also approve. COMMENTARY: Reassuring the Jewish people that they stand to lose nothing by throwing their lot in with the Romans. 36) But for the matters that he decided should be submitted to the king, send someone to us immediately with your decisions so that we may present them to your advantage, for we are on our way to Antioch. 37) Make haste, then, to send us those who can inform us of your preference. 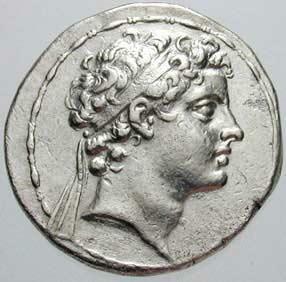 COMMENTARY: They want to know what King Antiochus Eupator offers so that they can outbid him. 38) Farewell.” In the one hundred and forty-eighth year, the fifteenth of Xanthicus. COMMENTARY: That would be March 12, 164 BC.